I’m away on holidays and have invited some of my blogging buddies to share their creativity Octavia and Vicky readers. Our guest today is Kate from Picklebums. Please make her feel welcome! I have four kids – twin girls aged almost 9, and two boys aged five and two. They all love doing arty activities. I usually love doing arty activities, except sometimes when the thought of setting up, supervising and packing up makes me want to crawl back into bed and never come out! Luckily I have a long list of easy art activities. These are activities that don’t require much set up, or much cleaning up and once I get them started, my older kids can manage these activities pretty much on their own. Kate is an early childhood educator and mum of four, living on a small property in rural Victoria, Australia. Kate’s blog, Picklebums, covers topics such as; gentle parenting, gardening, activities for kids, a recipe here and the occasional free printable, as well as anything else that pops up in her crazy life! It was Paul’s birthday recently and I thought it would be fun to try some messy art while making some cute wrapping paper at the same time. Here’s how it’s done. ~ dampen each cloth, fold into a square and place on the plate. ~ pour paint onto the cloth. You need just enough to turn the cloth into a stamp pad. 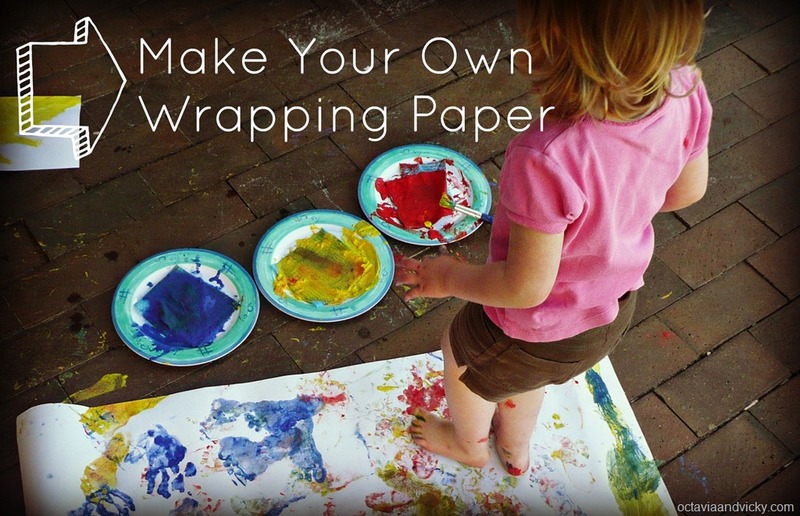 ~ set up your paper, lead the children to the paint and stamp away! ~ when you’re done leave your wrapping to dry and hose off plates and children. Use sticky tape to secure your paper to the ground before you start. Have extra paint ready to top up the ‘stamp pads’ as needed. For easy clean up keep this activity outdoors (you didn’t need me to write that, did you?). Go straight from art to bath if the backyard hose isn’t working out for you. Tempura powder paint does flake off a little with handling. If you want to avoid further mess try poster paint. I highly recommend having a go yourself. 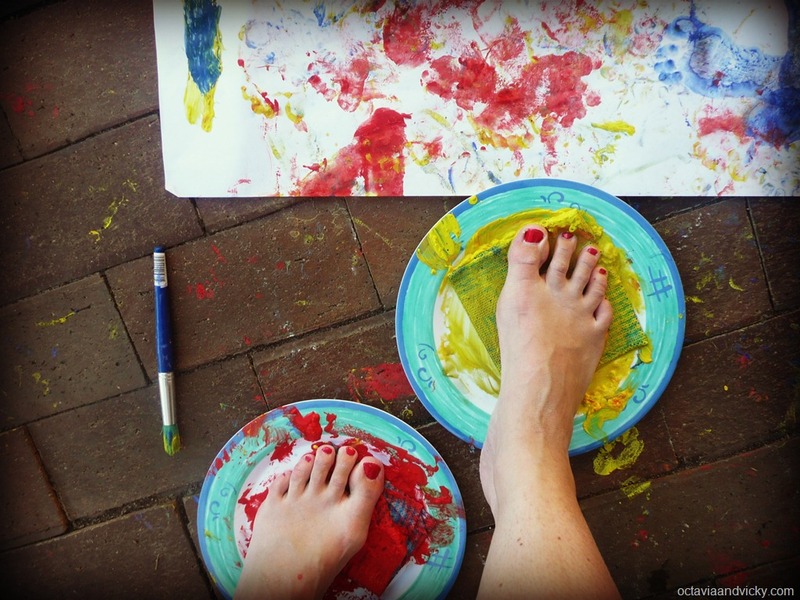 There’s nothing quite like the feel of paint between your toes. Instant childhood, right there. try this with any age child – or adult! we stuck with footprints but you could try out all different parts of the body, or grab some leaves from the garden for leaf stamping. What takes you back to your childhood? *If you’re a fan of sugar you can use white or brown sugar (approx 3/4 cup) instead of dextrose, and golden syrup (approx 2 Tablespoons) instead of glucose. But PLEASE give this sugar free version a try, it is seriously good. ** I may have decided to make a slice after placing my first batch of biscuits a little too close together and kinda making a ‘slice’ by accident. Ahem. The batch in the photos was my second go at it, and made into a slice on purpose. If you want biscuits then make sure you leave a nice good space between each one, this mixture spreads ALOT. 1 1/4 cups dextrose (available with the home brewing gear in supermarkets or here). 1. Preheat oven to 150 degrees celcius (300 F). Line a slice tray with baking paper. 2. Sift flour into a large bowl. Children LOVE measuring, pouring and sifting, this is a great job for little helping hands. Is it slower? Yeah! Messier? Yeah! More fun? Yeah! 3. Add oats, coconut and dextrose, then set aside. Lots more measuring and pouring here, or if you have electronic scales you can have a natter about how much you need and which numbers you need to stop at. 4. Melt butter in a saucepan, then add syrup and water. Allow mixture to boil briefly before taking off the heat. 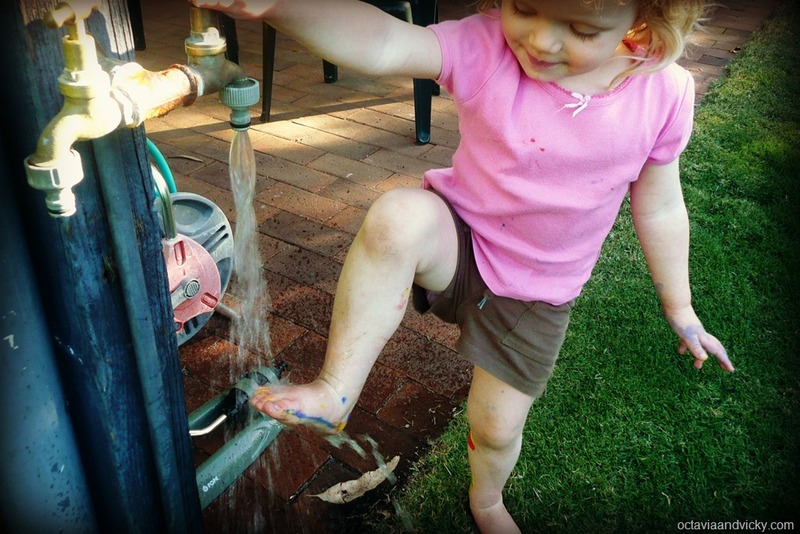 Very young children should stand well back at this point, but older children (school age) can help with supervision. A sturdy stool, chair or step will make it easier. 5. Add baking powder to the saucepan, allow it to foam, then pour immediately onto dry ingredients. Mix well. Baking foam is F U N to watch foam up, but keep little ones away from the flames (surely you didn’t need me to write that, but there it is). This mixture is hot so take care. Have a mix yourself first, then as it cools (and it cools in seconds) kiddos can take over. 6. Pour into slice tin and spread evenly. If you pour, they can spread. Team work! Don’t forget to lick the bowl…. mmmmmmm. 7. Bake for approximately 20 – 25 minutes, or until just golden and no longer wobbly for perfectly a soft and chewy slice. Cook for five minutes longer if you’d like it firmer with more crunch. Set the timer and go for a play, or do the washing up together. Pebble is a huge fan of doing dishes (yep, once again, slower, messier but MORE FUN). 8. Leave to cool in the tin for about 10 minutes then pop it on a wire rack to cool enough for chopping and storing. Try not to eat too many pieces as you go! Set yourselves up for an afternoon snack or to take your slice to share with family and friends. UPDATE: Read more about my sugar free journey and get yourself a recipe for Sugar Free Portuguese Custard Tarts here. This was so simple. I cut a potato in half and into the cut side of each half I made a poppy shape (how clever am I!? Well, I was impressed with myself). 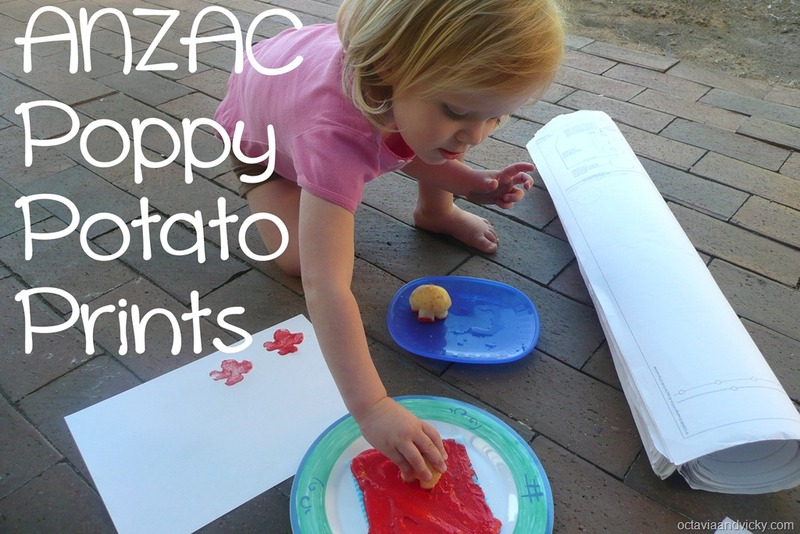 I poured red paint onto a damp folded up wash cloth which was sitting on a plate, this created the stamp pad. Child + stamp + paint = DONE! 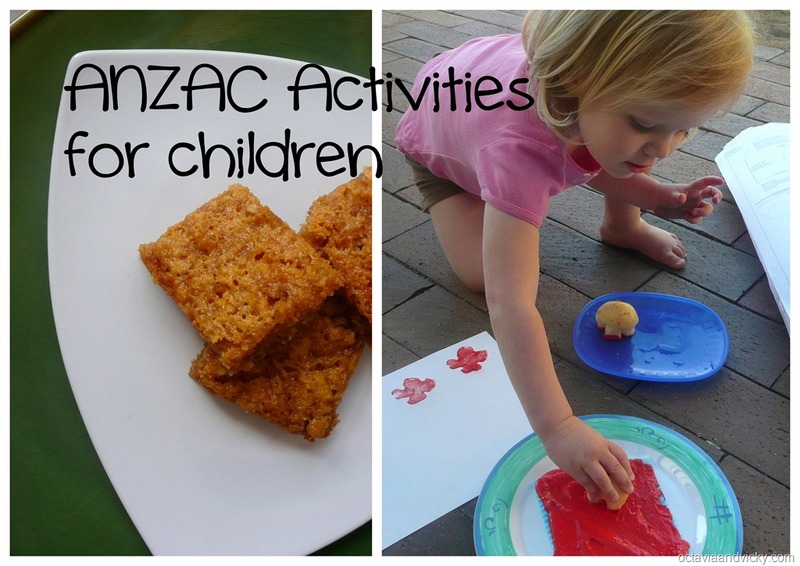 For child friendly ways to explain ANZAC Day to children, visit ANZACday.org.au. For information on ANZAC Day services in your state go to http://www.rsl.org.au/ –> Commemoration –> ANZAC Day. 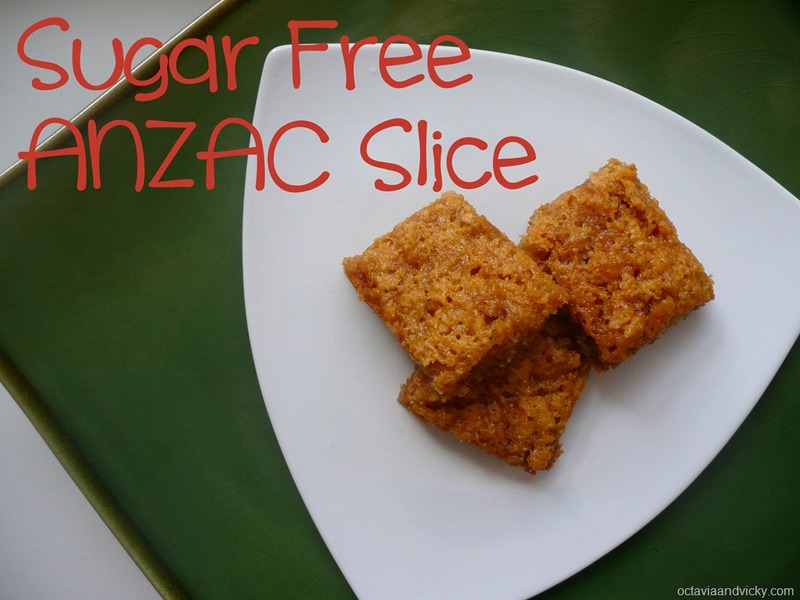 Free ANZAC Printables from mooo.com.au. I’ve been looking forward to trying this for a while now and a little gap in our afternoon provided the perfect chance to throw it together. a stick, paint brush, old pencil or fingers! 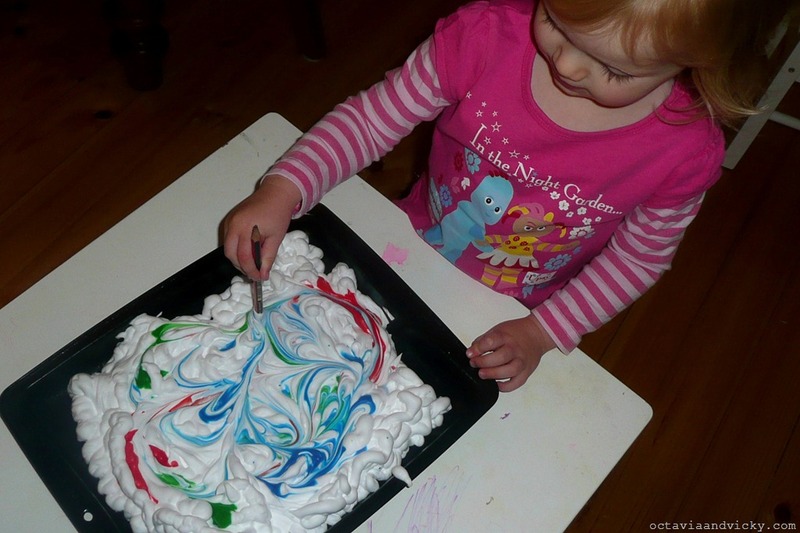 I set up some shaving foam in an old oven tray, drizzled it with food colouring and made sure the paper was close by. I threw some old clothes on the kiddo and myself, grabbed an old pencil for swirling the colours and we were away! Pebble had a ball swirling those colours around and around, I think she would have been happy to do that all day. Then came the printing! 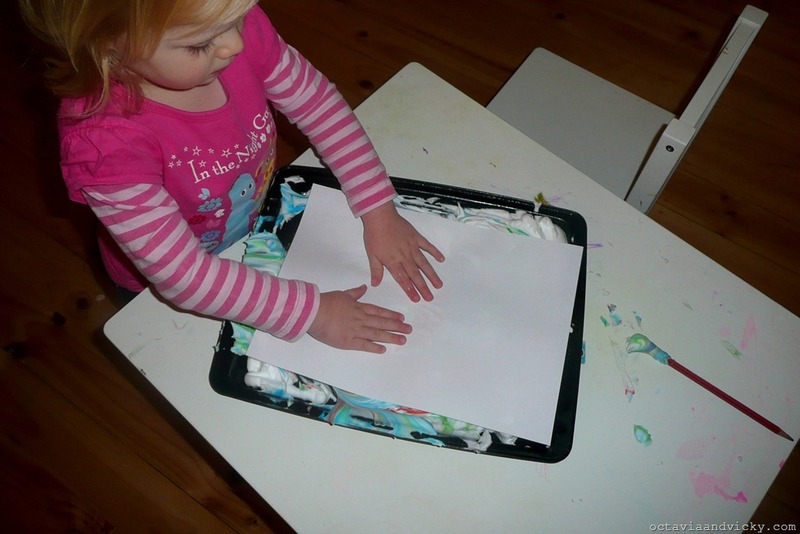 Pebble was able to press the paper onto the foam herself, with some instructions to press gently all over. Then I helped her to lift the paper off and scrape the excess foam away revealing an ooooooh-aaaaaaah inspiring print. We did about five prints, re-swirling inbetween, before the colours started to get really murky. Tips: have an old damp cloth close by to wipe up mess and some folded paper or sturdy card to scrape off the excess foam from each print. You can also set up some sheets of old newspaper to put your prints while they dry. If your child has sensitive skin it might be best to avoid this activity, however Pebble is one of these sensitive ones and she had no worries. Use your own judgement! Got a baby? This is not cool for babies. Everything goes in their mouths and shaving foam is not food, peeps! 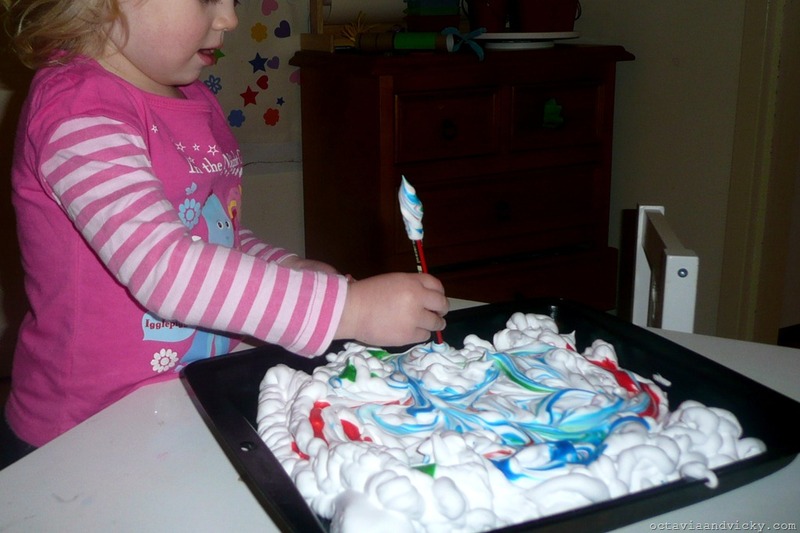 Try this sensory play idea instead. Got a preschooler or a school kid? 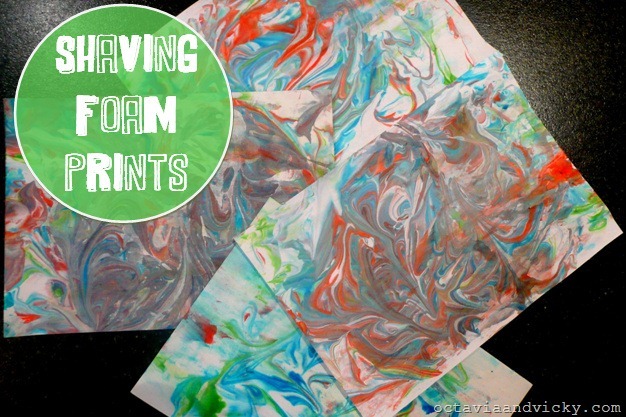 Try levelling off the foam and writing or drawing in it before making a print for a different effect. Use different objects (old toothbrush, comb, fork) to ‘draw’ in the foam before printing. Got a classroom of school kids? Aren’t you brave to try this? But you can! Each child can have their own paper/plastic plate with a small amount of shaving foam and smaller pieces of paper for printing. Or set it up as a small group experience – I recommend no more than four at a time!